Hello Putting Maestro in training - this guide is going to show you how to shave strokes off your game with a few tips, tricks and drills for the putting green. There is no fluff in this guide, just actionable, practical tips to drop that handicap like a hot potato. But don't worry, this isn't some guide written by a pro that talks about the putting arc and inside to outside - I still have no idea what they talk about. This is a no BS guide to get you draining more putts and having more fun on the greens. I don't want you to change your stroke and I don't want you to buy new clubs. Keep reading to unlock the potential you didn't even know you had. These two concepts go hand in hand for the ultimate in easy alignment on the greens. I draw these on by hand with a Sharpie, but there is a product made by SoftSpikes which you can clip onto the ball so you can draw dead straight lines with a Sharpie. Remember to use a permanent marker because whiteboard markers will rub off. As you walk up to the green, start looking at where the hole is in relation to your ball. • Is it uphill or downhill? • Is my ball on a higher or lower tier to the pin? • Is it uphill or downhill after the ball goes past the hole? If your putt is uphill, congratulations. You can be more aggressive on the stroke. If your putt is downhill, you need to be thinking about hitting it a bit softer. 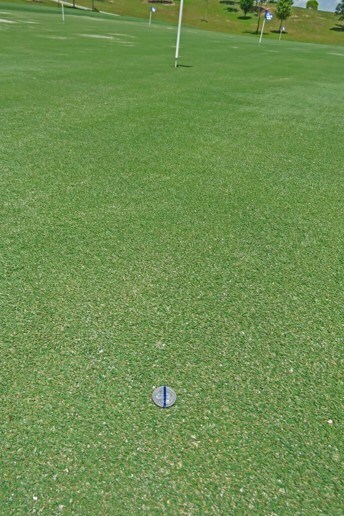 Look at the green between your ball and the hole. Try to guess a line quickly. It doesn't need to be highly accurate because you will adjust it twice more in the next few steps. 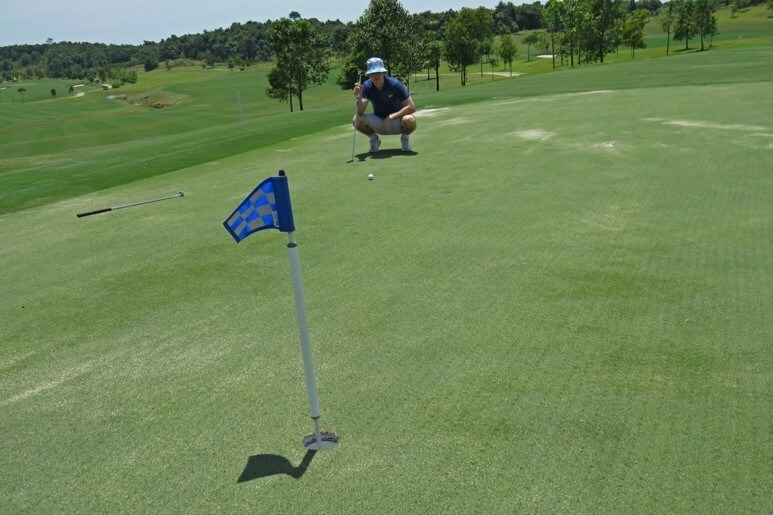 If you think your putt is right to left, then first mark the ball with your marker that has a stripe on it with the stripe pointed to the right side of the hole. 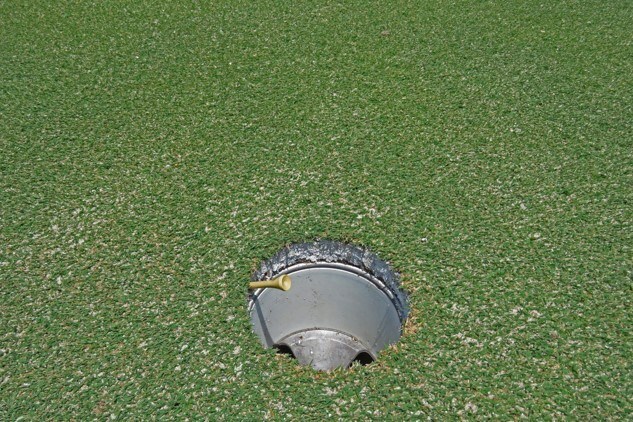 In the picture below, I thought the putt was straight initially so the line on the coin points straight at the hole. 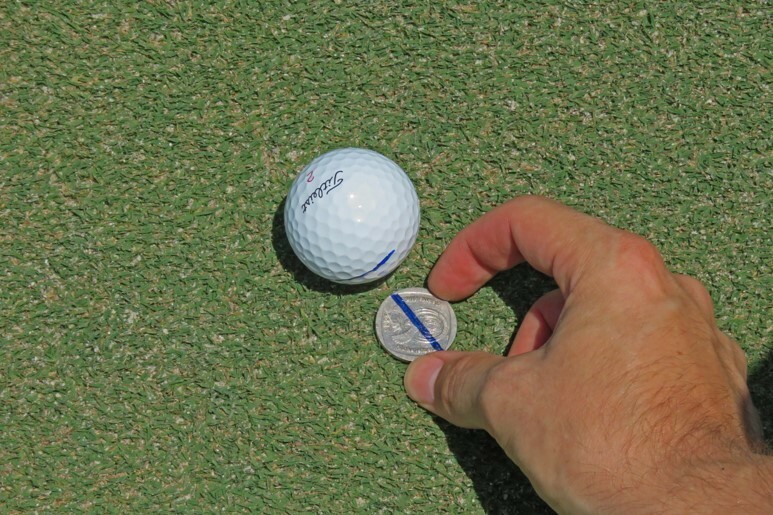 Stand back after marking your ball with the striped coin and look at the line you think your putt might take to the hole. You might change your mind about your initial thoughts at this stage. Ask your caddie or use your experience for this step. After you decide on the line move onto the next step. Double check your coin line is pointing in the right direction - if it isn't, put your ball down again and turn the coin to aim to your new target. The easiest way to do this is to find a blemish or different color grain of grass on your decided line and line up the stripe on the coin to that point. Pick up the ball again and wait while others play. 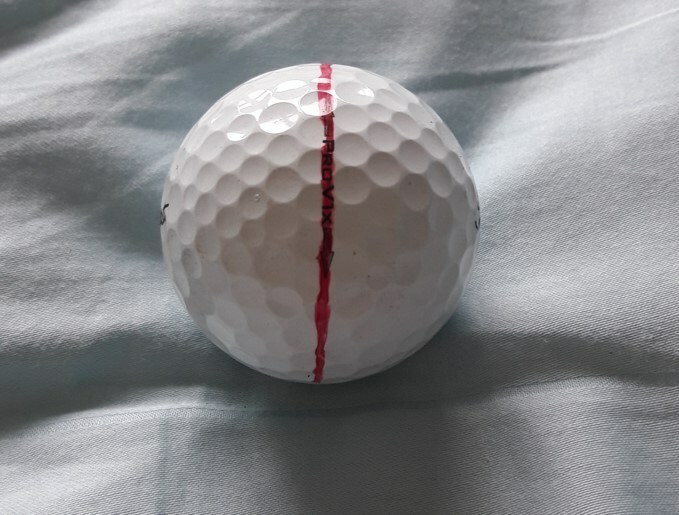 When it's your turn to putt, put your ball on the green and line up the stripe on your ball with the stripe on the coin which is now pointed exactly where you want. 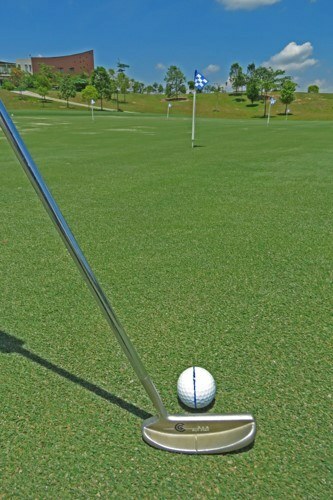 The stripe on the ball should be perfectly lined up to your putting line now! Alignment done. Stand away from your ball so you don't hit it on your practice strokes! Then look at the hole and swing the club back and forth to feel the distance to the hole. You've successfully lined up the ball so you don't need to worry about the line anymore. Just FEEL the amount of power you need to hit the ball past the hole by one foot. While you do this, actually visualize the putt going into the hole. I want you to see it going on the line you chose and curving into the middle of the cup. You need full commitment to your line and length of stroke before taking your putt. The feel will depend on uphill vs downhill and distance to the hole. 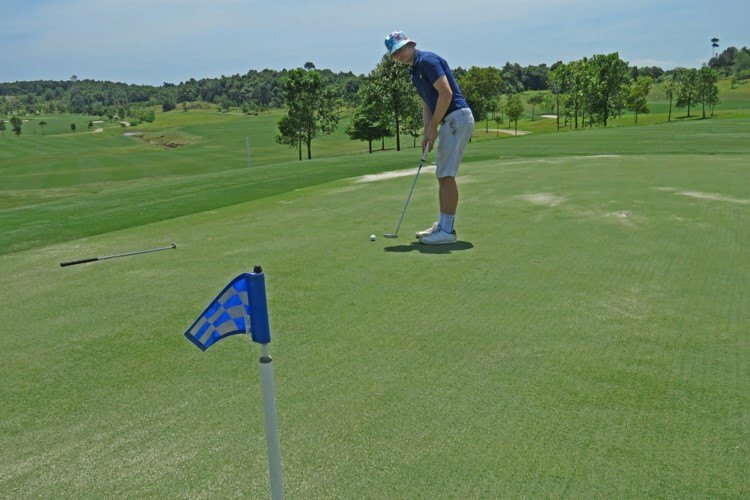 It's always best to hit the practice green before a round and hit a few putts from various distances uphill and downhill to get a feeling for the greens. There is no secret tip to getting the feel of the greens. You just need to practice and keep playing. Now comes the part you're gonna love the most. 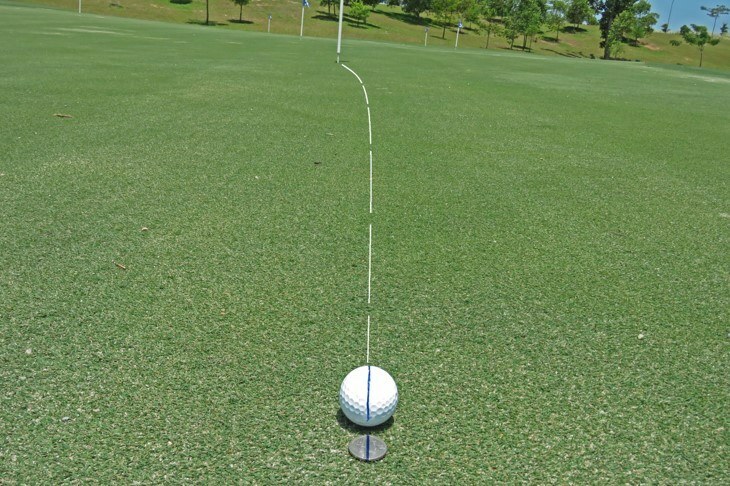 Now you've finalized the line and you've felt the distance to the hole with some practice strokes, you're thinking you can finally hit the ball. Not so quick though my padawan! DO NOT lift your head or even sneak a peak with your eyes on your putts. 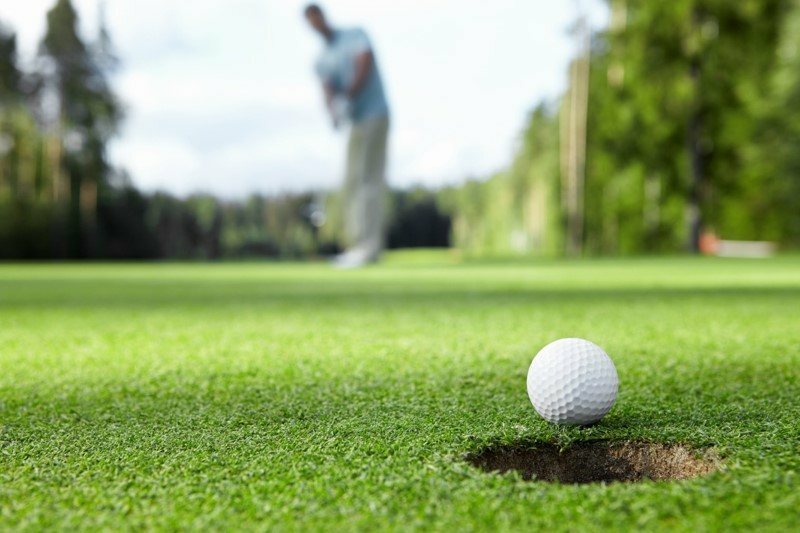 On lag putts it's okay after the ball has left your putter, but inside 10 feet, you MUST NEVER see the ball going into the cup. You should only hear it. Your head must remain completely still throughout the putting stroke. Your eyes must be lasered in on where the ball is resting. Your eyes mustn't even sneak a peak at the putt going in the hole. This is MUCH EASIER SAID THAN DONE. You think it sounds easy, but once you hit the course, the anxiety of the unknown takes over and you find yourself looking up before you've even hit it. This is the number one reason guys miss shorts putts and I bet if you can do this one thing out of this whole guide, you'll drain way more putts. You can stand with an open or closed stance. You can swing that putter how you like as long as you get the ball started on the right path. But my one plea to you sir is, NEVER LIFT YOUR HEAD! Story time: This story has happened countless times when I play in betterball competitions or team matches. I usually pair myself up with a 12 to 18 handicapper while I play off between 3 and 6 handicap. This is a perfect combination for betterball. Back to my point though: like a lot of mid handicappers, my partner, Peter Nader was a consistent 17 handicapper. On a good day he could shoot a 90 with a few pars in there for a respectable day. But what I noticed with Peter is he couldn't drain anything inside 10 feet like a lot of us when we're off a mid to high handicap. Stroke was okay, but nothing dropped. I did notice he looked up as he putted which meant he missed every putt to the right. So what did I do after the third missed 6 footer on the 4th hole? I said hey Pete, wanna make more of those putts and win this thing? Take the ball back and putt it again. But this time don't look up at all, just keep your eyes pointed down and WAIT FOR THE RATTLE! I'll watch it for you. So he makes that 6 footer with ease second time round, but what happened over the next 14 holes was beautiful. He shot an 84, the best score of his life and we won the betterball easily. He was a good chipper, so knocking it close and making the 5 or 6 footer for par made all the difference to his score. He still remembers that putting lesson and reminds me every time I see him. I've copy pasted this same story with hundreds of golfers during a round and we almost always finish in the prizes. I just love helping guys have fun on the golf course and get that smile when the light bulb moment happens. And I love winning prizes! Now onto the importance of a solid setup and stance with good fundamentals. Try to get your left eye as close to directly over the ball as you can. Of course, it's not an exact science but it's very difficult to look at the line of the putt while standing over the ball when your eyes aren't over it. Try to put your hands ahead of the ball at setup. That means the shaft will lean forward and that's perfect. It's not an exact science either so play with it. You might get good results with hands ahead by 6 inches or by a ball hair. Up to you. This promotes a forward rolling ball without backspin on it so that the ball doesn't bounce and skid along the green. If it skids, you lose control of the putt quickly. When putting, only your shoulders and arms should move. There should be almost no wrist movement and your head should stay absolutely still. Your eyes should still be looking at the place your ball was before you hit it after you do hit it. To further eliminate wrist movements, you can put a thicker grip on your putter like the Superstroke. Your legs should be quiet and not moving at all. There's no weight transfer. Short putts can be incredibly frustrating. I bet you know the feeling: you've done all the hard work of getting the ball within 4 feet for a working-man's par but your monkey brain takes over and you MUST see if the ball will go in the hole before you even hit it. So you baby it and lift your head and the ball lips out on the right. Warning: This is a technique I suggest you practice a lot before introducing it on the golf course. 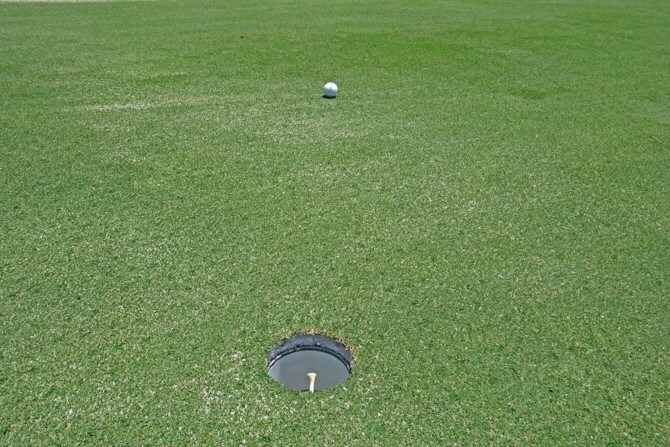 If you miss the hole, you could have an even longer return putt! 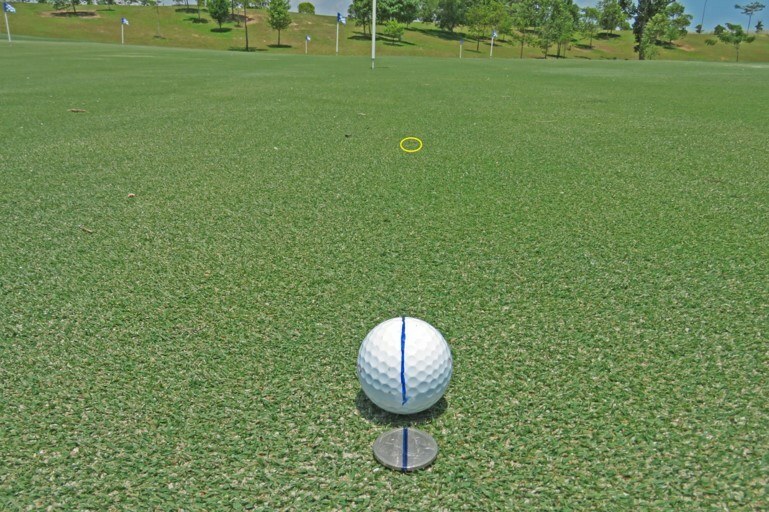 Fixing one foot putts: Aim center of the cup and hit it hard. Do not lift your head at all. Yes, people do miss these and I've been guilty myself but it's impossible to miss if you go center of the cup with a firm stroke. Fixing 2 to 4 foot putts: In 99% of cases, it's best to aim for a spot inside the hole. I don't go outside left or right lip for my line on these putts. Then I hit the putt firm so that it hits the back of the cup and negates any break there might be in the putt. Try not to make the ball trickle into the cup, but instead hit the back of the cup. According to my statistics I keep on my scorecards, I make 94% of all putts inside 5 feet. I really hope you can implement this into your game and enjoy making those high pressure short putts. Just KEEP YOUR HEAD DOWN AND WAIT FOR THE RATTLE! Here is how I hit short putts. Don't be shy to even let the ball slam dunk on short putts when you're trying this out on the practice green. You can experiment there and see just how firm you can hit a short putt without fear and then take your new-found skill onto the course. Take a few practice strokes to feel the amount of power you need. Set up to the ball with your left eye over the ball. Line up the alignment aid on the back of the putter to the line on the ball. Hit the putt but don't lift your head. Don't let your wrists break. They should remain firm. WAIT FOR THE RATTLE. 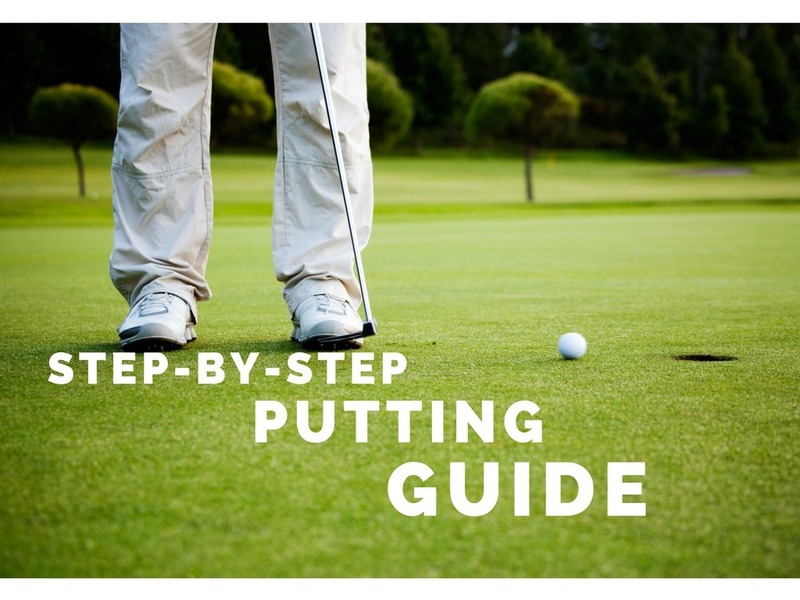 I hope this guide helps you make more putts short or long. Would like to say wow don’t normally read to much Golf information, as after a well it becomes a bit of an overwhelming over load of not what to do on the golf course. So would like to say thank you so much on simple terminology of Golf which it is will take your methods on to the course this weekend and hope it works for me. Hi Richard, thanks for the comment. I am happy you appreciate the content. I would like to help as much as possible so let me know what else you’d like to see and I will do it! is it against the rules for a player to guide the ball when putting….in other words pushing the ball instead of striking it? Yes it is against the rules. It must be a strike. I really appreciate your work. II’m a pretty big fan. Regarding short putts, your methods above work great for me. However whenever I’m faced with a tricky downhill lie, and hit the ball firm, the ball ends up 10 ft past the cup or even more sometimes depending on the slope and speed of the greens. I didn’t see you cover this scenario, at least in this article. Do you cover that kind of situation anywhere else? WuddaPlaya!!! I have to say, I watch a lot of golf content on the internet. But, I have never gained as much helpful information as I have gained with you. Your guidance on putting and golf management is awesome. keep up the great work. btw – if you could shoot a round on a course you have not played on, and describe the hole and the management steps you would take, it would be a great. I really love and appreciate your vids. They have made me re-think a few things about golf.